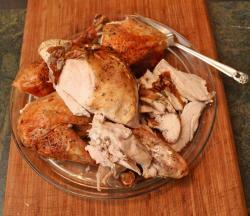 To get started, you need a perfectly roasted bird. 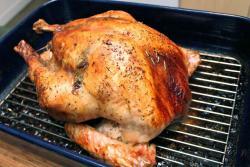 (Let it rest at least 20 minutes after removing from the oven.) This one is on the smallish side—12 pounds plus a little—but this technique is the one to use on almost any fowl. You need the proper utensils. A sharp carving knife, a sharpening steel, and a big fork. A big cutting board is helpful. 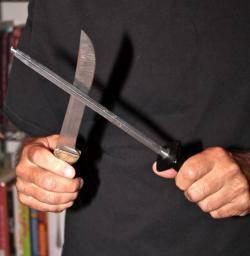 Using your sharpening steel, put the edge back on your knife and remove nicks. Remember: a dull knife is more dangerous than a sharp knife. 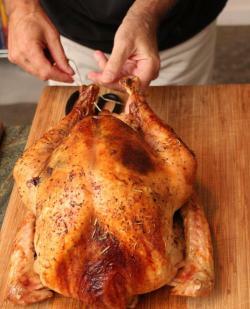 Untruss your bird, and remove any skewers you might have holding various bits of skin in place. Get rid of the twine and skewers—don't leave them cluttering up your cutting board. 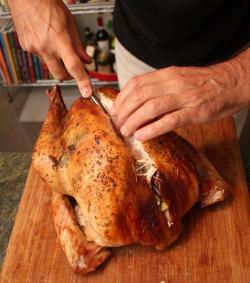 Remove any stuffing from the bird. 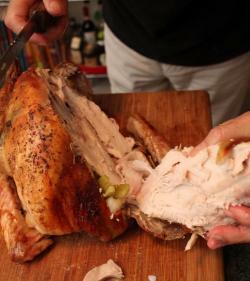 We used onions and celery in this example, but now is the time to remove traditional stuffing as well. 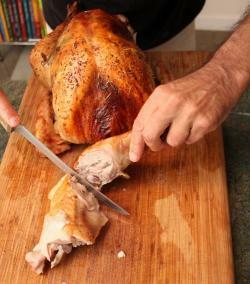 Grasp the leg in one hand and slice down into the bird with your knife pulling the drumstick slightly down and away as shown. The goal is to remove the turkey leg AND the thigh in one piece. 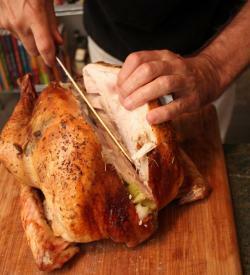 Then separate the thigh from the drumstick by finding the socket joint and manipulating your knife to separate the two pieces. 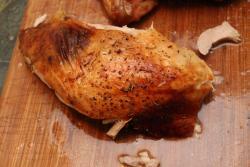 Keep at least one drumstick whole as in any group you'll find someone who just loves that part of the turkey. 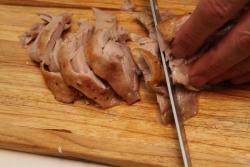 Then remove the thigh bone by slicing along both sides of the bone; pull out to remove. 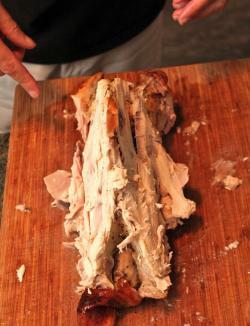 This should leave you with a whole deboned piece of thigh suitable for slicing. Next, we want to remove the breast from half of the turkey. Using your fingers, locate the breast bone that runs down the length of the bird and carve down as close to the center bone as you can get. 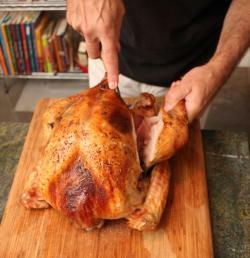 You're going to cut almost through the bird- use your non-knife-wielding hand to pull the breast back as you cut so you can see to keep your knife close to the bone. that looks like this. Clean, and perfect for slicing onto your platter. 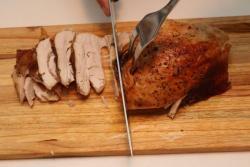 Remove the breast to a separate cutting board and slice across the grain. 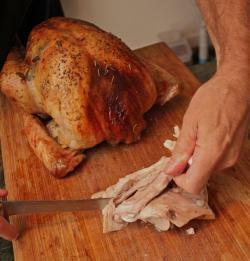 A sharpened knife is key here as you will want to try to keep a thin strip of skin with each slice of turkey. Do the same with the de-boned thighs. and a carcass that has just enough meat left on it to make a nice stock for turkey soup.